Live sports events like the Super Bowl, World Series and Euro Cup often cause major changes in Pornhub traffic, especially in the cities that are playing. Last year we found that during the 2016 NBA Finals, fans of the Cleveland Cavaliers and Golden State Warriors dropped everything, including Pornhub, to cheer for their favorite teams. So our friends at Men’s Health asked how the same cities shaped up for this year’s finals. On June 12, 2017 the Golden State Warriors beat the Cleveland Cavaliers with a final score of 129 to 120. 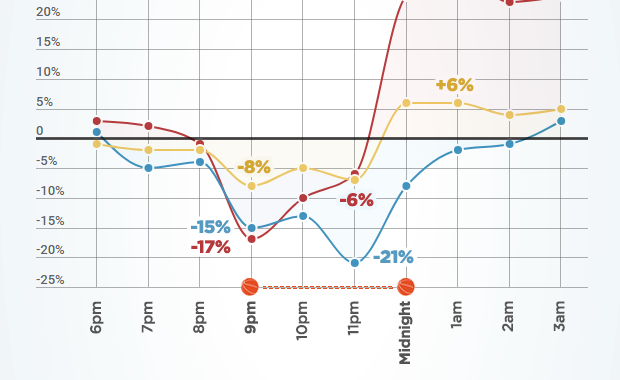 When the game began at 9pm Eastern Time, traffic to Pornhub was down -15% in the San Francisco Bay Area, and -17% in the Cleveland area, when compared to an average Monday. Across the United States, traffic was down -8%. Towards the end of the game, it seems that Cleveland residents had given up, with traffic down only -6%, while San Francisco stayed -21% below average as they waited to see their team win. After the game, traffic in San Francisco returned to normal, but folks in Cleveland looking to cheer themselves up after their team’s loss caused a +28% surge in Pornhub traffic between Midnight and 1am. 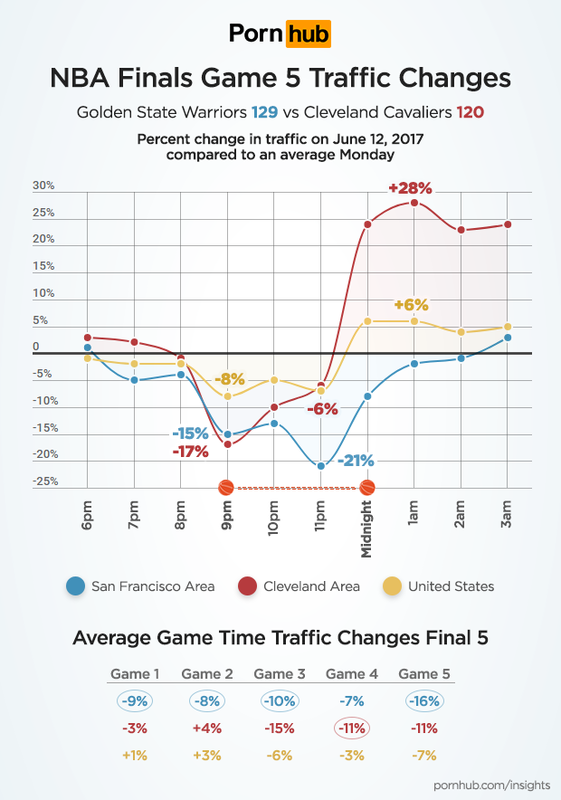 During the entire 5 game series, traffic was consistently down in both cities, with the exception being a +4% traffic increase in Cleveland during Game 2. Cleveland’s largest game-time traffic drop was during Game 3 at -15% while San Francisco watched Game 5 most closely with an average drop of -16%. The post NBA Finals Traffic – Warriors vs Cavaliers appeared first on Pornhub Insights.